President Barack Obama has declined to restore trade benefits under the Andean Trade Preference Act to Bolivia, citing the Bolivian government's acceptance of coca growing. The decision came in a Tuesday report from the office of the US Trade Representative. The report also complained about Bolivian nationalization of the hydrocarbon sector and increases in tariffs, but it was the pro-coca policies of the government of President Evo Morales that drew the sharpest language. Even while acknowledging that the Bolivian government continues to undertake significant interdiction efforts against the cocaine trade, the report criticized Bolivia for failing to adhere to US demands to decrease coca cultivation and for expelling the DEA from the country last fall. Since assuming the presidency, Morales has dramatically changed Bolivian drug policy from "zero coca" to "zero cocaine, not zero coca." Coca production has seen slight annual increases under Morales, but Bolivia remains only the third largest coca and cocaine producer, behind Colombia and Peru. 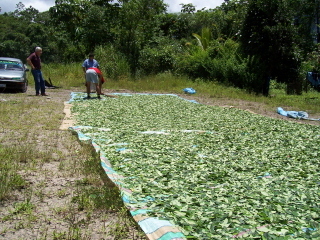 "The current challenges include the explicit acceptance and encouragement of coca production at the highest levels of the Bolivian government; government tolerance of and attractive income from increased and unconstrained coca cultivation in both the Yungas and Chapare regions; and increased and uncontrolled sale of coca to drug traffickers," the report scolded. "The efficiency and success of eradication efforts have significantly declined in the past few years." Tensions between La Paz and Washington have been high in recent years as Morales has defended the use and cultivation of coca and expelled US diplomats after accusing them of intervening in Bolivian internal affairs. Bolivia's close relationship with Venezuela under the leadership of President Hugo Chavez hasn't helped, either. And this won't help, either. President Morales reacted angrily Wednesday, saying the move contradicted Obama's vow to treat Latin America countries as equals. "President Obama lied to Latin America when he told us in Trinidad and Tobago that there are not senior and junior partners," he told reporters. The report, he added, used "pure lies and insults" to justify its decision.